Webinar presentations can be viewed on PC, Mac desktop or laptop computers and specified mobile devices. 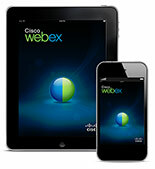 Click here for more information and instructions how to join a webinar on your mobile device. If you have any connectivity issues on your mobile device - please contact Cisco WebEx technical support at the number provided below. If you are using a PC or Mac - before connecting to the webinar, please check your system to ensure it meets the minimum requirements below. If you having any issues connecting to a webinar after checking your system, please call Webex technical support at the number provided below. Because of Google and Mozilla policy changes, users will need to manually enable the WebEx plug-in when using Chrome and Firefox. More information and instructions can be found in the Webex how-to guide for joining a WebEx Meeting (same as for webinars) on Chrome and Firefox FAQ.